You probably don’t think that Mexico and Lobster rolls go hand in hand. 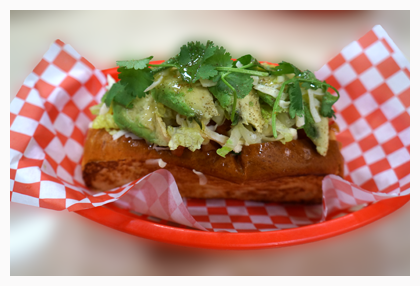 Think again and run, do not walk, to Da Lobsta for its Cinco de Mayo Mexican Roll Special. The roll can be made with Lobster ($12.95), Blue Crab ($10.95) or Shrimp ($8.95) and comes with Chihuahua Cheese, Avocado, Lettuce and Salsa. Get it on May 5 and save $2 per Mexican Roll. Happy Cinco Da Lobsta. Da Lobsta is located at 12 E. Cedar in Chicago’s Gold Coast and at 131 N. Clinton at the Chicago French Market.